In the elementary grades, teachers design storylines to facilitate students’ inquiry and discovery. Teachers also work together to provide instruction that connects across grades and goes into greater depth as students progress. Here are a few of the topics covered in kindergarten through fifth grade. The kindergarten students work together on a mapping unit. They gather information about their neighborhoods and create first a flat and then a three-dimensional map of Portland. The students begin by learning about how the Willamette River and Burnside Street divide the city into quadrants. Then, using a bird’s-eye perspective, the students place their addresses and homes on the map. 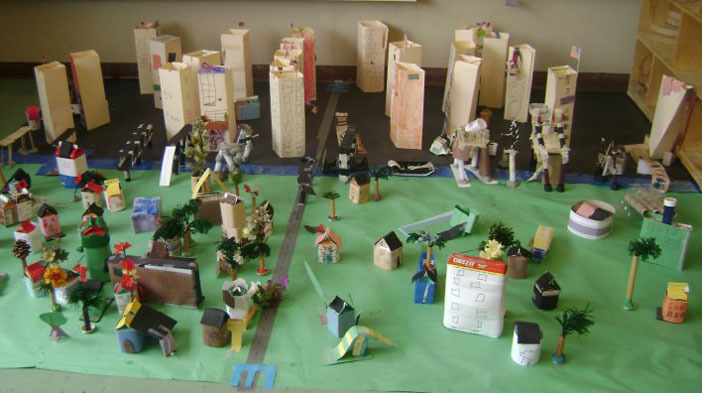 The students then construct other important landmarks in the city, such as the bridges and downtown skyscrapers. Each fall our fifth graders enter a storyline based in the Pacific Northwest. The underlying focus of the storyline is a study of Northwest ecosystems. They use the salmon as an indicator species around which their work revolves. The class creates a small Oregon coast town, and each student assumes the persona of a citizen. Over the course of a couple months, the student/citizens experience and study many events that might happen in a real town. The students participate in simulated role-plays and write up their reflections in journals. A major issue that the students study is the decline of the fish population in general and salmon in particular. The students investigate this problem; they look for possible causes for the decline and postulate potential solutions. The students use the internet to research the issue and do simulated experiments in the classroom. The class also goes on field trips to study salmon habitat in our area (both in rivers in the city and out in the forest). Along with the investigation into salmon, each student chooses a particular Northwest macro-vertebrate and writes a research report on that animal. In conjunction with the storyline, the class raises salmon in a classroom incubator and then releases them into the Willamette River. This activity is done in cooperation with the Oregon Fish and Wildlife Department’s STEP program.